New First Legion Release, Anglo Zulu Wars, Expected June 2014! 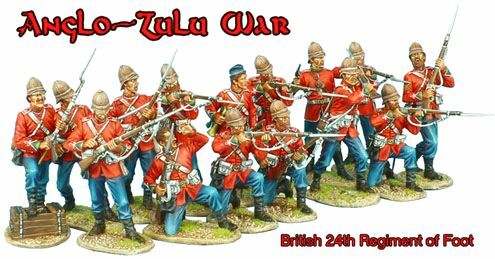 First Legion is extremely pleased to present our newest figure range, the Anglo-Zulu War!!! Part of a larger plan to cover the wars of the British Empire, we are launching the range with the iconic Great British 24th Regiment of Foot. Elements of the regiment were heavily engaged in the desperate and heroic defense at Rorke’s Drift where less than 150 British soldiers held off a Zulu force numbering close to 4,000. In this action, the 24th Foot were awarded more Victoria’s Crosses than any other single regiment in a single action in British military history. Around the same time, the bulk of the regiment was decimated at the Battle of Islandawana where over confidence led to the annihilation of the British and allied forces. With the stunning sculpting and hand painting that is our hallmark, these wonderful new figures can be used in a wide variety of dramatic displays. Zulu Warriors will follow up soon after the initial release. New Khaki Army Releases Available Now! 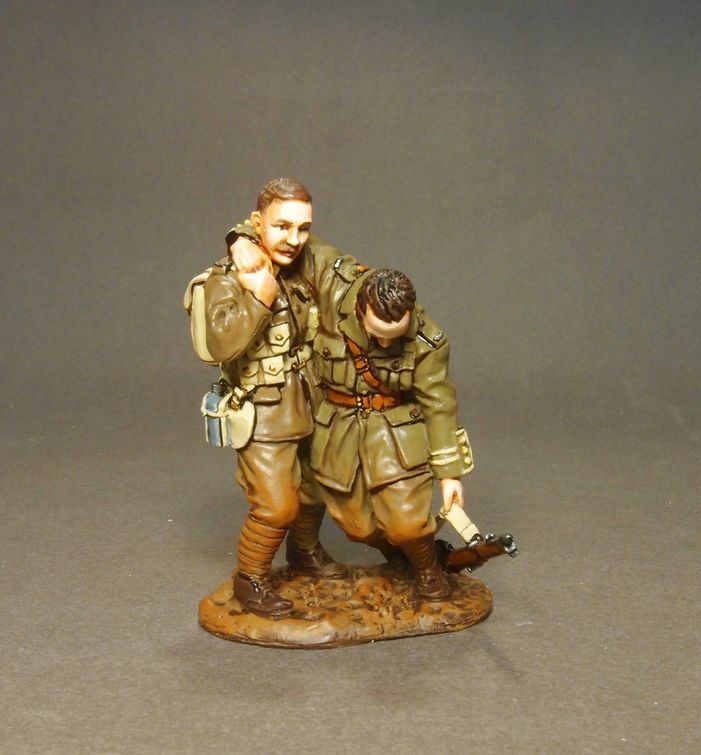 KHAKI ARMY 12 inch cold cast bronze figurines are as individual as the service personnel they portray. 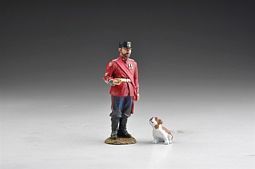 Unlike mass-produced collectibles, our finely sculpted collector figurines are cast and finished one at a time – so each sculpt really is one of a kind. Often 2 years go into an individual sculpture, including over 200 hours of sculpting time. Extensive research and fine sculpting ensures that each subject is as historically and physically accurate as possible. Each casting is serial numbered. New Figarti Releases Expected Summer 014! New John Jenkins Arrivals Expected June 2014! The first VC awarded during the first World War to a Welshman. William Charles Fuller VC (13 March 1884 – 29 December 1974) was the son of William and Mary Fuller of Laugharne, Carmarthen. He was born in Laugharne, West Wales, and died at the age of 90 in December 1974. Educated in Swansea, he joined the Army in 1902 during the Second Boer War. He was recalled as a reservist in 1914. On 14 September 1914 near Chivy-sur-Aisne, France, Lance-Corporal Fuller advanced under very heavy enemy rifle and machine-gun fire to extract an officer who was mortally wounded, and carried him back to cover. Fuller won his VC for saving Captain Mark Haggard, nephew of Rider Haggard, who had fallen wounded. He carried him a distance estimated at 100 yards to a ridge where he managed to dress the officer’s wounds. Capt Haggard asked L/Cpl Fuller to fetch his rifle from where he’d fell. He did not want the enemy to get it. Fuller managed to do this. With the help of two others, Private Snooks and Lieutenant Melvin, Officer i/c the machine-gun section of the Welsh Regiment, they managed to get Haggard to the safety of a barn that was being used as a First-Aid dressing station. L/Cpl Fuller remained with Captain Haggard trying to help him until the officer died later on that evening. His last words to Fuller were “Stick it, Welsh.” After he’d died L/Cpl Fuller attended to two other officers who had also been brought to the barn wounded. (Lt. The Hon Fitzroy Somerset and Lt. Richards.) The barn came under heavy fire and the wounded men and officers were evacuated. Later it was razed to the ground with German shell-fire. GWB-080 — The Welsh Regiment, 2nd Battalion, L/Cpl William Charles Fuller VC, Chivy-sur-Aisne, France,14 September 1914. 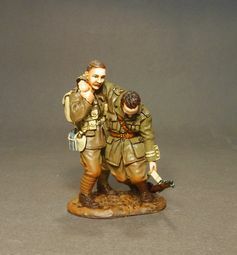 On the 29th of October he was wounded while dressing the wounds of Private Tagge a fellow soldier, shrapnel entered his right side, twelve inches in up to his shoulder blade and came to rest on his right lung. After he was sent to Swansea Hospital where they operated, removing the shrapnel. He was given a home posting after his recovery, as a successful recruiting sergeant in his native Wales. The Tin Shed Museum was set up in 2011, by Andrew Isaacs and Seimon Pugh-Jones. Andrew was an armourer and Seimon a photographer. Seimon’s camera work has taken him into the realms of staff photographer for an American War Magazine (Armchair General) and has seen him work on many historical features such as “Band Of Brothers”. John Jenkins was born and brought up in Carmarthen, and had worked for many years as a Designer in Welsh language TV and Theatre. Seimon and he had never worked together, but both were aware of each other’s abilities. 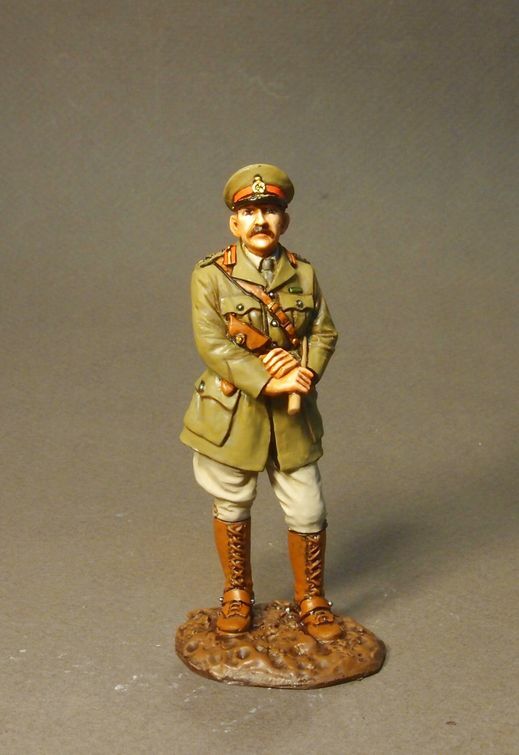 It was John’s eldest sister Sarah, who finally introduced the two Carmarthen boys, and suggested that they work together to design and produce a figure of W.C Fuller, to commemorate the local VC winner from Laugharne. The set #100 of this Limited Edition set, will be presented to Seimon and Andrew, at the London Toy Soldier Show, 7th June 2014. The Medium Mark A Whippet was a British tank of World War I. It was intended to complement the slower British heavy tanks by using its relative mobility and speed in exploiting any break in the enemy lines. Possibly the most successful British tank of World War I, the Whippet was responsible for more German casualties than any other British tank of the war. Whippets later took part in several of the British Army’s postwar actions, notably in Ireland and North Russia. At Bapaume, on the 28 August 1918 the Whippet “Caeser II” was under the command of Lt C.H.Sewel , who was to be awarded the V.C. He dismounted from his tank to rescue the crew of another Whippet that had overturned and caught fire, he succeeded ,but was killed in the process and awarded a posthumous Victoria Cross for his bravery. Lieutenant Cecil Harold SEWELL, 3rd Battalion Tank Corps FREMINGCOURT, August 29th 1918. This officer displayed the greatest gallantry and initiative in getting out of his own tank and crossing open ground, under heavy shell and machine gun fire, to rescue the crew of another Whippet of his section, which had side slipped into a large shell hole, overturned and taken fire. The door of the tank having become jammed against the side of the shell hole, Lieutenant SEWELL, by his own unaided efforts, dug away the entrance to the door and released the crew. In doing so he undoubtedly saved the lives of the officers and men inside the tank, as they could not have got out without his assistance. 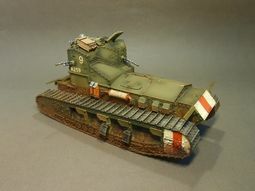 After having extricated the crew, seeing one of his own crew lying wounded behind his tank, he again dashed across the open ground to his assistance. He was hit while doing so, but succeeded in reaching the tank, when a few minutes later he was again hit fatally, in the act of dressing his wounded driver. During the whole of this period he had been in full view of and at short range of enemy machine guns and rifle pits, and throughout, by his prompt and heroic actions, showed and utter disregard for his own safety. General Sir John Monash GCMG, KCB, VD (27 June 1865 – 8 October 1931) was a civil engineer who became the Australian military commander in the First World War. He commanded the 13th Infantry Brigade before the war and then, shortly after the outbreak of the war, became commander of the 4th Brigade in Egypt, with whom he took part in the Gallipoli campaign. In July 1916, he took charge of the new Australian 3rd Division in northwestern France and in May 1918 he was made commander of the Australian Corps, at the time the largest corps on the Western Front. On 8 August 1918 the successful Allied attack at the Battle of Amiens, which led to the expedited end to the war, was planned by Monash and spearheaded by British forces including the Australian and Canadian Corps under Monash and Arthur Currie. Monash is considered to be one of the best Allied generals of the First World War. The First Australian Imperial Force (1st AIF) was the main expeditionary force of the Australian Army during World War I. It was formed from 15 August 1914, following Britain’s declaration of war on Germany. Generally known at the time as the AIF, it is today referred to as the 1st AIF to distinguish from the 2nd AIF which was raised during World War II. The 1st AIF included the Australian Flying Corps, which was later renamed the Royal Australian Air Force. The 1st AIF was a purely volunteer force for the duration of the war. In Australia, two plebiscites on conscription were defeated, thereby preserving the volunteer status but stretching the AIF’s reserves towards the end of the war. A total of 331,814 Australians were sent overseas to serve as part of the AIF, which represented 13% of the white male population. Of these, 18% (61,859) were killed. The casualty rate (killed or wounded) was 64%. About 2,100 women served with the 1st AIF, mainly as nurses. Close to 20% of those who served in the 1st AIF had been born in the United Kingdom but all enlistments had to occur in Australia (there were a few exceptions). As a volunteer force, all units were demobilized at the end of the war. The French army was manned by conscription , and every 20 year old male was liable for three years’ service. Most men would go into the infantry, and these were men primarily from an agricultural background, with those who had worked on railways, public works, shipyards and telecommunications going into the artillery. Infantry Regiments were created on a local basis, similar to the British Pals battalions. The peacetime army had a strength of 817,000 men, augmented on mobilization to 2,944,000. During the war 7,800,000 men served with the “colours”, about 80% of the population of men eligible to fight. Water was scarce in the front line, and the growing of facial hair led to the nickname “Poilu” (hairy one). The traditional nickname of the infantry was “Les Biffins” (the rag and bone men), initially to each other they were “Les bonhommes” (the lads), or as the war drew out, “Les pauvres cons du front” PCDF, (the poor bastards at the front). GWF-022 — French Infantry 1917-1918, 123e Regiment of Infantry, PCDF Sergeant Walking. – Please note that the French Infantry sergeants wore a single yellow band on their lower sleeves to denote their rank. The stripes on the upper right hand sleeve denotes years of service. Other lower ranks the stripes and rank bands were issued in a blue colour. Allied planes were normally pulled/pushed backwards into the hangers, with the aid of a Tail/Skid Dolly. This was a small cart designed to be placed under the tail skid of the aeroplane. This avoided the Tail skid digging into the ground, and made pushing the aeroplane backwards much easier. 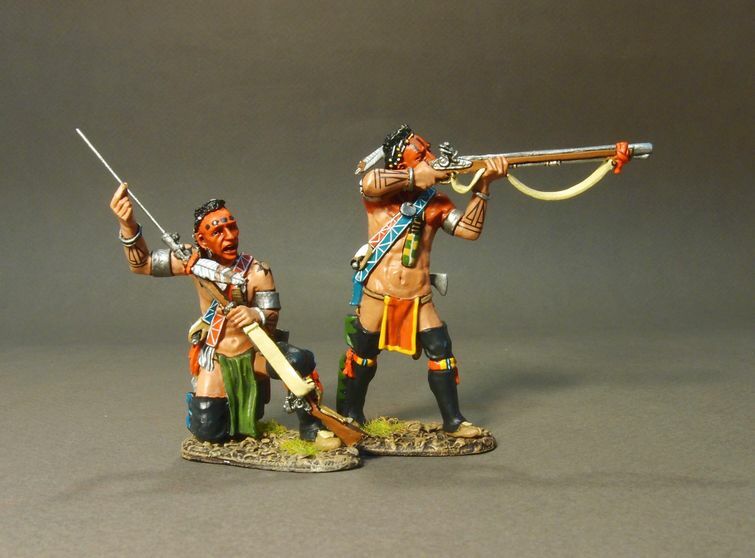 RR-031A — Stockbridge Indians, Woodland Indians Skirmishing #1A. 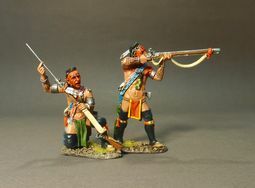 – This is the first of several Woodland Indian skirmishing sets, with red cloth tied to the ends of their muskets to indicate that they were allied with the British. RR-031B — Stockbridge Indians, Woodland Indians Skirmishing #1B. During the reign of Queen Anne of Great Britain the English Army had become very disorganized and undisciplined. The Hanoverians (George I) who succeeded Queen Anne in 1714 reorganized the English Army, requiring the troops to march in step to proper military music. Thus fife & drum music was adopted by the British military (except for the Scottish regiments). A company of about 100 men would have one or two fifers, and one or two drummers. When 8 or 10 companies were gathered together to form a regiment, their fifers and drummers were “banded” to form a regimental band. The musicians provided music for the army on the march. As Napoleon would prove, music would be very effective in motivating an army to march long distances. The musicians were also used to broadcast various signals. Military camp life required a succession of daily signals: time to get up, breakfast call, sick call, assembly, lunch, duty calls, dinner, evening retreat, lights-out (curfew). The “Tattoo” comes from the Dutch die den tap toe which was a signal for the beer sellers to “turn off the taps” so that the soldiers could finish their beers and report back to camp. This signal consisted of the fifes and drums marching up and down the streets of the garrison town or camp, playing as they marched – at the end, they would stop marching, and conclude with a hymn. While the army was encamped (or billeted in a city) the “officer of the day” (supervising at that moment) would always have a drummer with him to give impromptu and emergency signals: to sound “alarm” at an imminent attack or to call for a conference of the officers. Contrary to common opinion, signals generally were NOT given during battles, excepting “cease fire” and related signals. The battlefield was too noisy and confusing, and, as the French discovered when they experimented with the idea in the 1750’s, the enemy can hear your signals. Barrell’s Regiment , the 4th Regiment of Foot, were to bear the brunt of the Jacobite attack on Cumberland’s left flank at Culloden. 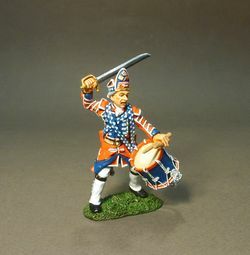 Since it was a Royal regiment, the drummer was issued with a red coat faced with blue. Drummers of non royal regiments wore coats of the facing colour , and were faced red. 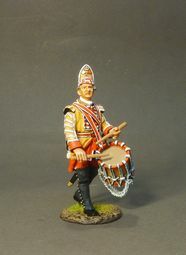 There were normally two drummers per company in a regiment. New Thomas Gunn Releases For May! this time in shirt sleeve order takes aim at the advancing Mexicans. MADFFL006 — Wounded Legionnaire – A badly wounded Legionnaire looks on in shock as the Mexicans gradually overpowers his comrades. 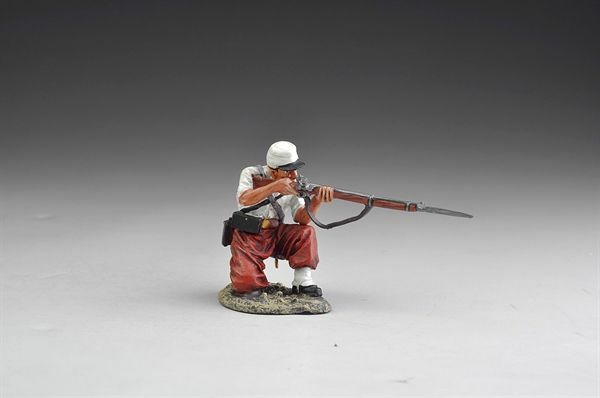 TG-FREE011 — Dead legionnaire wearing red trousers – Dead legionnaire wearing red trousers, also comes with kepi and rifle. Suitable for the FFL series or also for early WW1 Western Front if you hide the Kepi! 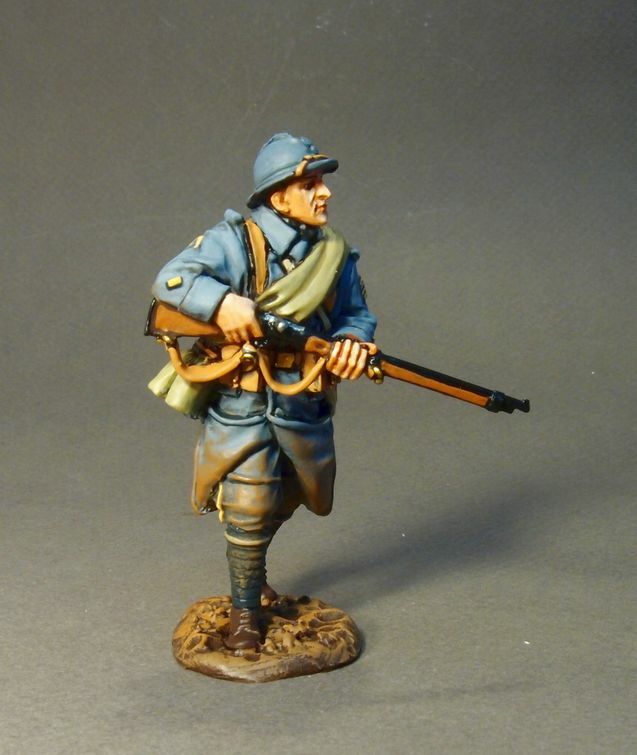 Continuing with the FFL ‘Beau Geste’ range we have added 2 casualty Legionnaires plus a new version of the very popular HMG set recently released. FFL016C — St Etienne MG Set (Gunner Bandaged) – Our 3rd and last version of the St Etienne HMG set. 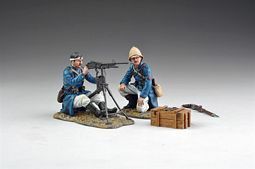 The gunner this time has no hat but sports a bandage covering a nasty head wound whilst the number 2 wears the traditional Pith style hat issued to legionnaires from the late 19th century onwards. FFL022 — Dead Legionnaires – Two Legionnaires who won’t be going home lie dead on the ground. 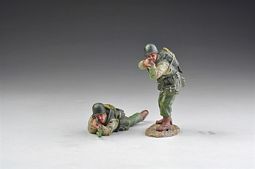 More additions to one of our bestselling series, some British 24th of Foot in a variety of poses. SFA002B — Running 60th Rifles – By popular demand we have remade SFA002 this time with the correct style Pith hats, rifles and uniform details! The set features two Privates running to or away from the action, you decide! SFA008 — NCO Pointing – An NCO from the 24th laden down with full kit shouts orders out to fellow platoon members. SFA010 — At Attention – A Private from the 24th stands to attention whilst waiting to be inspected. Dressed in full campaign gear, these young men know that very soon they will be facing the Zulu or the Boer! 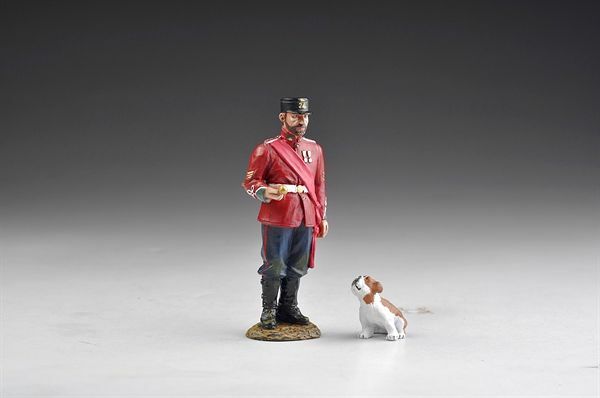 SFA011 — Sgt 24th Regiment – A Senior NCO with British Bulldog puppy gets ready to bark out orders to his waiting men. Dressed for parade with red sash and cane stick, this Sgt is the epitome of the Victorian soldier! SFA014 — Swinging rifle – A Private from the 24th ammunition expended and bayonet broken takes a last desperate swing at his opponent. Time is definitely running out for this young soldier unless helps arrives pretty soon! SFA015 — Lying down reload – A Private from the 24th reaches down for more ammunition from one of the pouches of his Slade Wallace webbing. Three more figures as we trundle on towards the 100th Anniversary of the start of WW1. 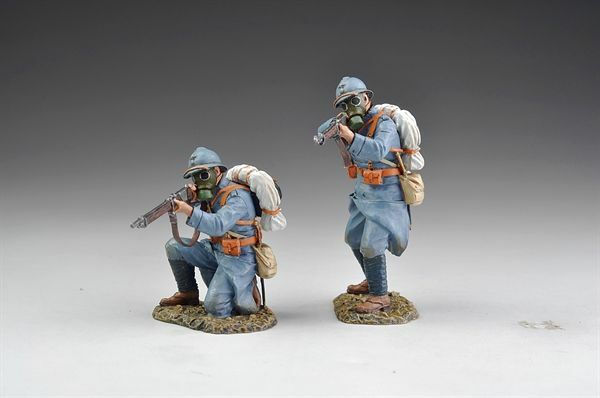 GW023 — French WW1 infantry with Gas Masks – One soldier stands firing whilst the other fires from the kneeling position. Both soldiers laden down with full kit and wearing the 1917 ARS gasmasks. Both soldiers can be used in the ‘ready to fire’ position or ‘firing downwards’ at a prone target. We have four German prone position soldiers coming soon which would all make good targets for our Poilus! 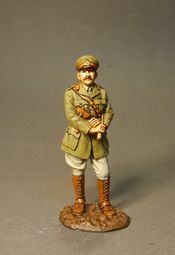 I have attached pictures of a German officer in clay sculpt form so you get the idea of what is coming! GW024A — US Sentry with Boston Pit Bull Sgt Stubby – Sgt Stubby was the most decorated dog of WW1, being wounded several times in action who also learnt how to warn his unit of incoming gas attacks after himself being gassed. Stubby was a member of the 26th American Division but we have him here on temporary loan to a member of the 82nd All American Division. 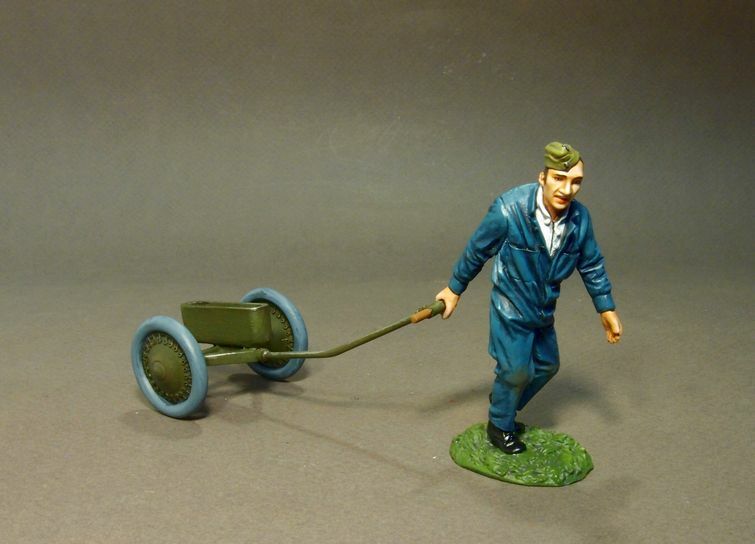 Available as an A version with sentry wearing ‘Drill Hat’ or as a B version later next month with sentry wearing British style ‘Tin Lid.’ Please note grass has been added to the base of the sign and the wording ‘War Dogs’ has been increased to the same size as the other wording. USA002A — US Army Rangers Part 1 – Two NCO’S from the 2nd Rangers in full beach assault gear make an appearance to commemorate the 70th anniversary of D-Day. One figure stands with knees bent firing whilst the prone position Ranger takes careful aim. The A version figures wear Paratrooper style high leg boots whilst the B version (coming next month) wear the more traditional gaiters and net covers on their helmets. USA003A — US Army Rangers Part 2 – More Rangers to complement our D Day Anniversary commemoration. This time a standing Ranger takes aim with his carbine whilst the kneeling Ranger kneels on the deck also giving covering fire. Once again the A version figures wear high leg paratrooper boots whilst the B version (available next month) wear gaiters and net covered helmets. towel in and puts his hands up whilst his not so lucky comrade has already taken a fatal wound, for both the war is over regardless! The A version comes in a Normandy colour scheme whilst the B version figures (available next month) will be suitable for a Battle of the Bulge winter setting. month by sea and therefore will be in UK late June. As this is so close to July 4th we will hold the release until then. The retail price will be $220 including the 2 pilot figures, the bigger box needed played a part in the bigger than anticipated price. For a limited edition jet fighter aircraft of 100 worldwide its extremely good value for money and is bound to be popular amongst collectors. This version of the Salamander was flown by Staffel Kapitan Erich Demuth and he is included with this aircraft, looking at his watch. Demuths plane sported his 16 kills on the tail fin, none of which were achieved in the Salamander as the aircraft saw very little combat service. Too little too late are the words that spring to mind on this occasion! Heinkel HE162 – Not yet listed on our web site. New King & Country Releases For May! VOLTIGEURS played an important role in Napoleon’s Army. He decreed that each Infantry Line and Light Infantry Regiment should select their finest marksmen and most agile soldiers and form them into special units that would provide one company in each battalion. These troops would act as “skirmishers” and “scouts” to help protect the main body as well as moving forward in loose order to be the “eyes and ears” of their commanders. Ten all-new K&C “Voltigeurs” advance forward in “action” poses to get to grips with the enemy. Special Uniform Note: Although wearing the same basic French Infantry uniform of the period Voltigeurs could be distinguished by their green and yellow epaulettes and collars as well as their black shako with the yellow stripe. French Artillery, Infantry, and Dragoons. few extra pieces to collectors’ D.Day Collections. DD224 — M3A3 Stuart – The M3A3 served alongside the M5 in the “scouting and screening role” in most U.S. Army tank battalions. Usually these battalions comprised 3 x companies of “Shermans” and 1 x company of “Stuarts”. Our model is typical of those that took part in post D.Day operations. DD228 — US Army Tank Riders Set #1 – Two kneeling GI’s, one with an “M1 Garand”, the other with the “M1 Carbine…can work equally well on the back of a fighting vehicle or on the ground. DD229 — US Army Tank Riders Set #2 – Two more GI’s, one kneeling, one sitting, armed with another “M1 Garand” and a “Browning Automatic Rifle”. As flexible as the previous two. THE RAF’s ONLY FIGHTER PILOT V.C. presented to RAF “Fighter Command” – to Flight Lieutenant James Nicolson. Flight Lieutant James Nicolson was a pilot with No.249 Squadron when on August 16, 1940 he was flying “GNA” on an operational sortie near Southampton when he was fired on by a Messerschmitt Bf.110. Enemy fire injured him in one eye and badly wounded his left foot. At the same time his engine was hit and the petrol tank set alight. As he struggled to bail out from the burning aircraft another Bf.110 flew in front of him…Struggling to get back into his blazing Hurricane he pressed the gun button and saw his bullets strike the German plane. After seeing the enemy aircraft crash into the ground, Nicolson successfully bailed out. On his descent, painfully injured, he had the bad luck to be fired on by members of the “Home Guard”,…fortunately their accuracy was not as good as the young Flight Lieutenant’s! On November 15, 1940, it was announced that Flt.Lt. Nicolson had been awarded the Victoria Cross for “Conspicuous gallantry and disregard for his own life”. He was later promoted and sent out to fly in both India and Burma. By May 1945 he was now a Wing Commander but alas lost his life in a flying accident in the Bay of Bengal. His Victoria Cross can be seen at the Royal Air Force Museum, Hendon, England. Our 1:30 scale Hawker Hurricane “GNA” comes with an unoccupied cockpit and a standing figure of Flight Lieutenant Nicolson. A specially-designed, full colour box also includes a certificate about James Nicolson V.C. 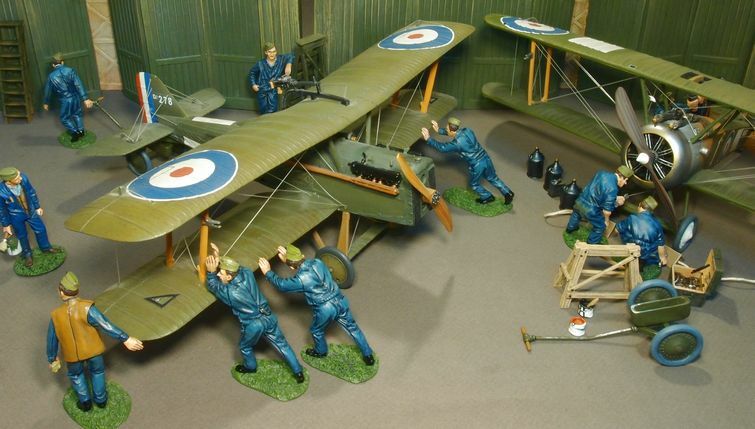 This “SL” edition comprises just 300 aircraft and figures. minor battle damage the store is still “open for business”. “Panthers”…Next to the “Tiger” it’s probably our most-produced German tank! and improved many of the characteristics of its Russian opponent. It proved to be an excellent combination of firepower, mobility, a wider track and good armour protection. From 1943 until 1945 just over 6,700 of all variants were produced. Note: All of the above figures can be utilized in or on vehicles as well as on the ground in action. WS272 — Panther Ausf. G – The “Ausf.G” version was reckoned, by most Panther crews, to be the best of all and the new K&C “Ausf.G.” is certainly the best we have manufactured! 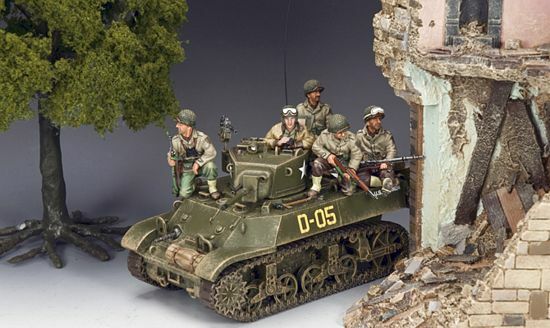 Our model represents a late-war, battle-weary, two–colour camouflaged “G” and comes with a tank Commander and plenty of space for either extra supplies or a number of tank riders. This is the first of two “G” models to be released…a second will be available later in the year. Copyright © 2014 SierraToySoldier.com All rights reserved.